[First Prize Winner Remi Mir not pictured]. CB/BS is pleased to announce the winners of the Isabelle de Courtivron Prize for 2014. Due to the outstanding entries received, the judges decided to award two students with the First Place prize. Remi Mir was awarded first prize for her memoir, "The Socks Don't Have to Match," about growing up Bengali-American. The narrative weaves together themes of "difference" and identity and captures a nuanced view of the relationship between young adults and their parents — which can be both fraught with tension as well as affection. 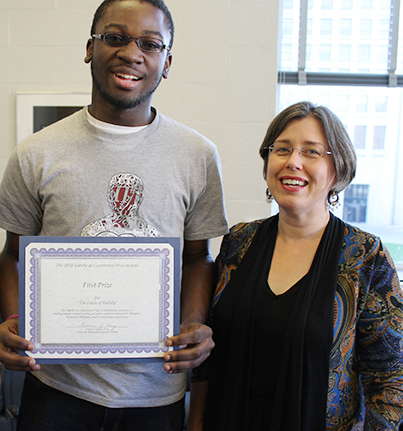 Daniel Stone was awarded first prize for "The Faces of Reality," a courageous and vivid coming of age narrative exploring dimensions of identity (sexual, personal, cultural, political, and academic) and the experience of growing up in Nigeria and coming to MIT.